Back in February of this year, Twitter made a big change that the majority of general users will not have noticed. However, those in the know and any marketers will have realised that the changes by Twitter made it impossible to share tweets which were identical or similar to one another. As one of the best strategies for building engagement was driven by the ability to re-share top tweets this was a blow to marketers. Sharing may no longer be allowed, but here’s the good news, retweeting could be just as effective in helping your business improve engagement and boost the reach of your top posts. In this blog, we’ll take a look at how you can use this simple strategy to get more clicks from your best-performing tweets. Many people are used to retweeting the tweets and posts of other users, businesses and friends, but have you ever considered retweeting your own tweets? This at first may sound like a silly idea after all your audience has already seen your tweet, so why would they want to see it again? But, the reality is that your retweet is likely to reach a completely different audience than your original tweet, especially if it is scheduled at a different time. There are a couple of reasons why we believe this strategy is effective. Firstly, the retweet is likely to reach a different audience than your original tweet; this means that if it performed well originally then it is likely to perform equally as well with a new, yet similar audience. 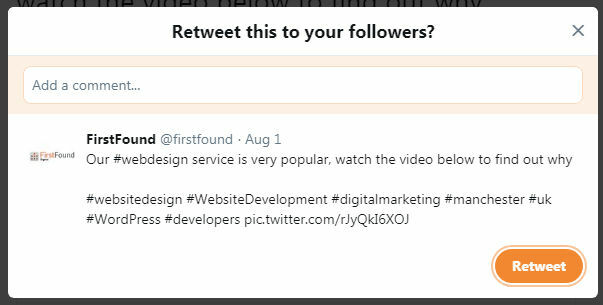 Secondly, by retweeting a popular tweet that has lots of likes, shares and clicks you are giving people social proof that the original tweet was well received and this makes it more likely to get further engagement. The great thing about this strategy is just how easy it is to implement and get it to work for your business. With no special tools needed this strategy really is simple so just follow the steps below to start enjoying better performance from your tweets. Just continue doing what you are already doing on Twitter, the first part of the strategy relies on building up the number of top tweets that you may want to retweet. For this strategy to be effective you should be posting regularly on Twitter and ideally should already be getting good engagement on your posts. As this strategy is based on retweeting your most popular tweets the next step in the process is to identify which of your tweets have performed best. The best way to do this is by using the in-built analytics functionality of Twitter. Just click on your profile image in the top right corner and head to Analytics to bring this up. Head to the top tweet section for a quick and easy overview of your top tweets, you can also change the date range to view top tweets for previous months which may be worth retweeting. Your tweet will immediately be retweeted so make sure that now is the right time to publish. We’d recommend not posting at a similar time as the original tweet to help ensure you reach a new audience. For those who want to schedule a retweet, there are plenty of social media management tools that can help make your job easier and allow you to build retweeting into your monthly social media strategy. Twitter is a great way to engage with your audience and retweeting your top tweets is a simple and extremely effective way of boosting the number of clicks and engagement that your tweets receive. Experiment with the strategy above and see what works for your brand and enjoy better performance with very little additional work. 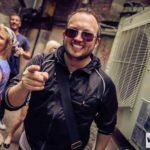 We’d love to hear your thoughts on this strategy and other techniques you’re using to get more engagement on Twitter, Facebook and Instagram so feel free to share your feedback in the comments section below.